Homepage. This page: Details on the small Raven Argonette, designed for light cars and motorcycle combinations. 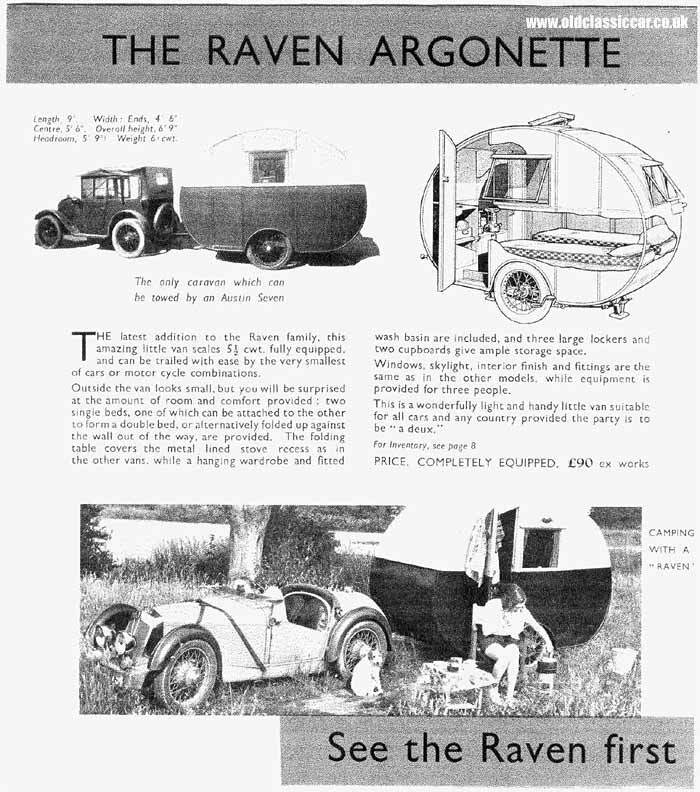 Raven's Argonette caravan from the 1930s. George, who has an eye for diminutive caravans of yesteryear, scanned and emailed me over this great old advertisement, which promotes the Raven Argonette. This tiny caravan measures just 9' in length, and is more egg-shaped than teardrop-shaped. The overall weight was just 6cwt or so, which made it viable for the motorist who only had the smallest of cars with which to tow a caravan. Amazingly the advert also suggests that a motorcycle combination (ie motorcycle and sidecar) could also pull it quite satisfactorily. I wonder how many people did try pulling it behind a motorbike? "Outside the van looks small, but you will be surprised at the amount of room and comfort provided: two single beds, one of which can be attached to the other to form a double bed, or alternatively folded up against the wall out of the way, are provided. The folding table covers the metal lined stove recess as in the other vans, while a hanging wardrobe and fitted wash basins are included, and three large lockers andtwo cupboards give ample storage space." "This is a wonderfully light and handy little van suitable for all cars and any country provided the party is to be 'a deux'. Price completely equipped. £90 ex works." The second main photograph shows a camping scene, with a Raven being towed by something altogether rarer than an Austin 7. The sporty number shown in a field is a very unusual Vale Special, a type that was thin on the ground even then. Thanks again to George for sending this over. Return to Classic Caravan section.